Can you believe it? The Directory Journal just turned 4! You’ve been loyal customers, readers, and visitors for years now and as such we’d like to thank you. You’re invited to our special 4th Anniversary Promotion from May 17th through June 15th. We know you already have reasons to love DirJournal.com. We’ve provided value to our clients for years, all while avoiding penalties many other directories have faced. That makes us reliable. We give you access to our audience of hundreds of thousands of visitors each month. We help you build relevant links and increase your targeted traffic. And we offer webmaster tools and information-packed blogs to help you improve your business or website. By joining us for our anniversary celebration you can get all of those things for 20% off (for all of our submission options)! But wait. It gets better. If you take advantage of our special offer by entering 4THANNDJ as your coupon code when you submit your site, you’ll also be entered into a contest! We want to do even more for our customers in the future. What would you like to see us do next? What could be improved to make the Directory Journal more valuable to you? We invite you to share your questions, suggestions, comments, and any concerns. Let us know how we can serve you better. And don’t forget, our anniversary contest and sale last only from May 21st through June 15th. So don’t wait around. 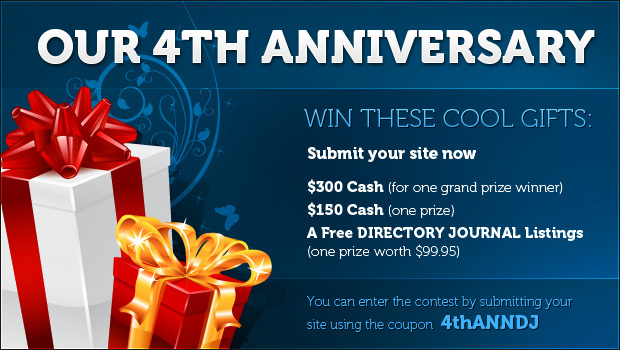 Submit your site today using code 4THANNDJ and be entered into our anniversary contest where you could win one of three great prizes! Help Directory Journal Help Japan — We’ll Donate 10% and You Save 25%!